← I Can Do It! Coming to Denver, CO in April. 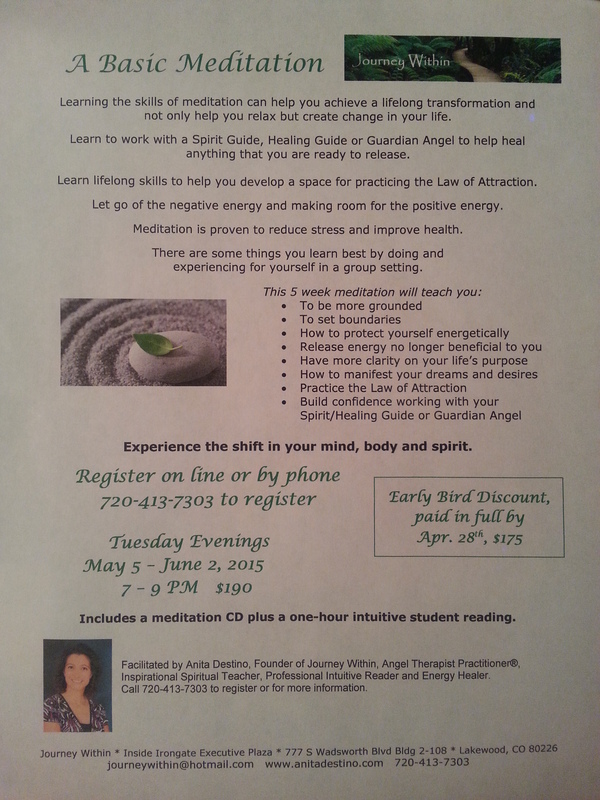 Our Level 1 -101 A Basic Meditation will be starting next week. There is still time to sign up for the Early Bird discount! A Basic Meditation is a fundamental class that gives you the framework to access and use your intuitive guidance system. The more you practice the tools taught in this class the more confident you will become in trusting your own intuition. As you begin to trust your intuition more and more you will use this as a means to guide your life and to make decisions that are true for you. Learn lifelong skills to help you develop a space for practicing the Law of Attraction. Learn the lifelong skills to develop a personal practice in our 5-week meditation. Letting go of the negative and making room for the positive. This class meets once a week for 5 weeks. This entry was posted in Angels, classes, Develop Your Intuition, Empowering, Energy Healings, Guided Meditation, guides, let go of negative energy, Life Purpose, Positive Energy, power of now, program, Releasing Energy and tagged boundaries, Guardian Angels, law of attraction, meditation, meditation class, release stress, spirit guides. Bookmark the permalink.